AMETEK Precision Motion Control has introduced ROTRON Chem-Tough regenerative (side channel) blowers for situations requiring safe and efficient handling of corrosive and/or potentially explosive gases. Applications include oil and gas, landfill gas recovery, chemical tank agitation, wastewater treatment and aquaculture oxidation. ROTRON regenerative blowers operate dependably in environmentally challenging, chemically corrosive and potentially hazardous conditions including methane extraction and flaring, according to the company. The blowers employ regenerative air technology to develop proper air pressures and vacuums. 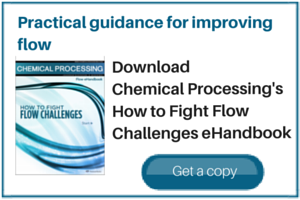 An extensive product range allows users to achieve ideal flows, pressures, and vacuums. Permanent salt spray resistance also makes them suitable for aquaculture. Rugged construction features include nickel-plated components and 303 stainless steel motor shafts and hardware. Custom designed seals assure leak containment. Use of low-friction polymers provides permanent “dry” lubricity. The blower’s low-noise, high efficiency aerodynamics are achieved through the use of lower speed, long-life AC Induction motors. The ATEX-certified, explosion-proof motors are custom-designed for harsh environments and available in all international voltages.